Thanksgiving Day for me is not just about family and food - it is about crushing Ole Miss in the annual Egg Bowl. 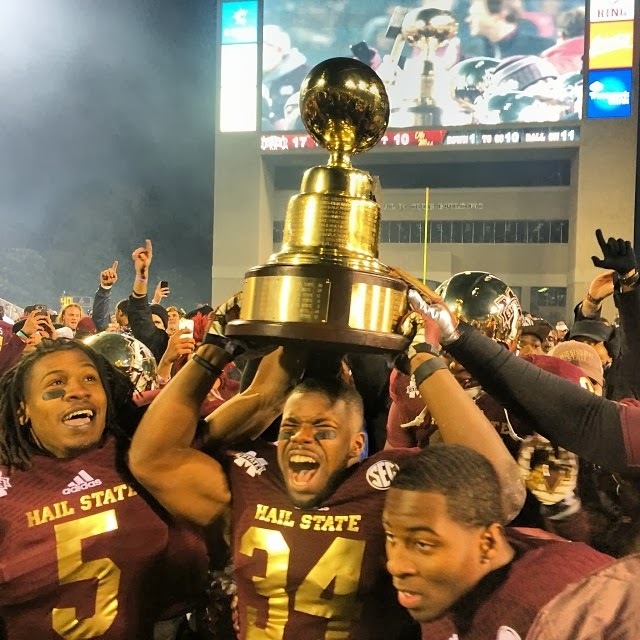 This year's team and this year's Egg Bowl was legendary. Our team faced a lot of adversity, but each challenge the team and our fans came together stronger and better. Watching the Egg Bowl you couldn't not think about team spirit - and not just the cheerleader kind. The no "I" in team kind of team spirit. I won't recount the emotion associated with this game, (but you can read an awesome account here.) The game got me started thinking about team spirit and caregiving and the correlation between the two. Our staff gets weary every time I use a sports analogy (which is a lot), but for those of us who grew up in sports, watch sports or jut love sports - the sports analogy is an effective way to relate to the world. A few years ago we partnered with the famous Coach Frank Broyles to create a caregiving "playbook," designed to help male and female caregivers navigate their way through Alzheimer's and dementia challenges. In all seriousness, you will find on this blog and in all of our materials, we often try to share the same message many different ways. For you sports lovers out there who are caregivers or are looking for ways to help out a caregiver you love, this one is for you. In order for you to make a touchdown on 4th & 3 in OT, you don't just need you - you need you PLUS a few really big and talented offensive linemen who can make a hole and punch you right through to the goal line. Your ability to be a strong caregiver depends greatly on the strength of your team and your ability to use their strengths! Think about the players you need on your team, from medical to financial to caregivers to support, and put a caregiving team together that will help carry you through. Nurture and teach your back up quarterback and your backup to the backup quarterback, because you are going to need them, probably in a moment of pressure or crisis. Train a number of people to help you with your caregiving duties in case of emergencies, and for those times you just need a few minutes to catch your breath on the sidelines. Your teammate will miss a game-winning 30-yard field goal seconds before the end of the game, sending you into OT, two games in a row. But that is o.k. 3.a. People are going to drop the ball, do things wrong, accidents are going to happen -but you can't write people off, yell at them or hate them, because you are going to need them down the road. Like to kick the extra point after a game-winning touchdown! And, I promise you, they are kicking themselves enough - and will come back next time stronger and better because of the experience. 3.b. DO NOT FREAK OUT! Nature tends to kick in when we freak out, sending all of our blood to our arms and legs - NOT to our brains. To be a good caregiver, you need your brain to be steady as a rock, especially in stressful situations! The best offense is a good defense. Knowing that we were down to our backup backup quarterback our game plan was to hold Ole Miss to as few points as possible, the winning strategy was up to our defense! And, boy did our defense step up!! When it comes to caregiving you have develop a defense, as in create plans ahead of time for a variety of situations - like going to the emergency room or if your loved one wanders. By keeping a strong defense as caregivers, we are ready for anything. Don't discount the important roll of the fans. Mississippi State is famous for our fans and our cowbells, the combination is deafening on the field. Visiting offenses can't even hear themselves think let alone hear their play calls. When Dak Prescott put on his helmet and trotted onto the field in the 4th quarter, the sold-out crowd went wild, sending him the clear message - we've got your back (read this to find out why this was such a big deal)! I am pretty sure you could hear the cowbells all the way to Tupelo. Friends, family, church friends, and neighbors have your back; the Alzheimer's Association has your back; support group members have your back. It is important to recognize who is in your fan base and let them cheer you on, and drown out those that don't. Caregiving is really hard, and it is easy to lose morale and get down - so when you are facing 3rd and 10 just make the call to your fans - MORE COWBELL, PLEASE! Here are a few things happening in the month of December! December 1: ANGEL'S PERCH is available on cable on demand, iTunes & Amazon! Click here for more details! December 24 & 25 - Alzheimer's Association offices closed, however our 24/7 Helpline (800.272.3900) is open throughout the holiday. 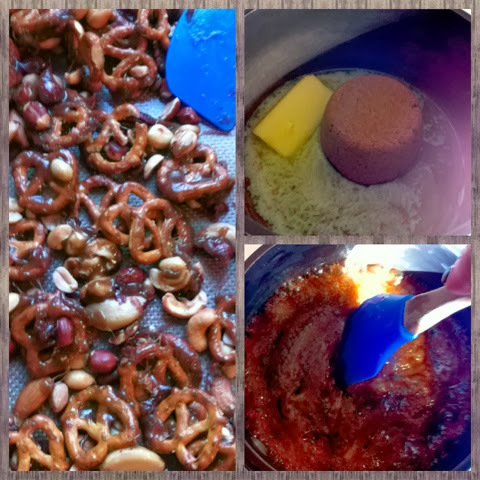 Preheat oven to 200 degrees F. Over medium heat, combine first 4 ingredients and boil for 5 minutes. Remove from heat; stir in baking soda. Stir well. Pour over the pop corn, nuts or whatever your heart desires. Stir to coat well. Bake in large roaster or pan for 1 hour, stirring every 15 minutes. Spread on waxed paper to dry.